Ready to provide a new solid wood pantry for your kitchen, the Amish Mission Two Door Hutch with Short Top Doors comes equipped to work. 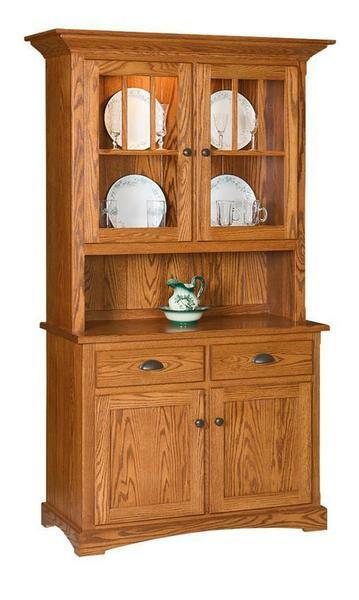 Lovely top cabinets provide room to display fine china or keep non-perishable items. A center counter space and two lower drawers and cabinets offer more storage and display. This wood hutch is simple mission style and is handcrafted in the wood and finish of your choice. DutchCrafters is home to custom furniture. We love matching custom options to your specific needs. Order online or a Furniture Specialist can be reached by email or phone to assist you. Thank you for shopping DutchCrafters for custom storage options.